Each year, one in four Americans experiences a mental or behavioral health disorder. One in five American adults reports having an unmet mental health need. Seeking mental health services has long carried a negative connotation, but public perception has begun to shift in recent years. More people than ever understand that mental health issues don’t discriminate by age, gender, sexuality, race, culture, or economic status, and are finally seeking the treatment they need. Behavioral health service providers in Santa Barbara County are struggling to keep up with the increased demand, and are constantly searching for diverse, qualified mental health practitioners. Experts in the field are calling for more inclusive and individualized treatment, arguing that when lives are at stake, the only solution is to provide immediate and effective preventive care. 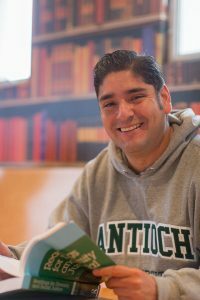 Students in the MACP Program at Antioch University, Santa Barbara have the option to participate in a Latino Mental Health concentration. In Santa Barbara County, this issue greatly impacts the many Latinx (meaning, “of Latin American origin or descent, used as a gender-neutral or nonbinary alternative to Latino or Latina”) community members in need of equitable access to culturally inclusive mental health services. Latinx individuals, many of whom identify as bilingual and bicultural, make up 38 percent of the population in Santa Barbara County. Behavioral health service providers like Child Abuse Listening Mediation (CALM) – which was awarded a contract in June 2018 to provide mental health services to Santa Barbara Unified School District (SBUSD) – serve a majority Latinx client-base; in 2018, 70 percent of CALM’s clients identified as Latinx. Santa Barbara County experienced a tumultuous 2018 that brought natural disasters, a nearby mass shooting and drastic changes to immigration policies, and local mental health experts have noticed a significant increase in demand for mental health services, especially among youth and Latinx community members. Accordingly, service providers are experiencing a particularly high demand for bilingual and bicultural mental health practitioners. 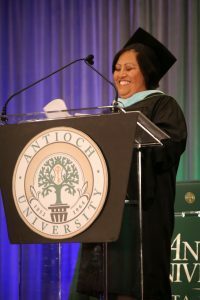 “The need for bilingual and bicultural mental health practitioners is at an all-time high,” said Dr. George Ayoub, the Interim Chair of the Master’s in Clinical Psychology (MACP) Program at Antioch University, Santa Barbara. “The need is evident in the school districts, in the universities, and for anyone connected to the community,” he explained. According to Dr. Ayoub, creating culturally inclusive spaces for Latinx individuals is extremely important, and the reason might seem quite obvious: in order for mental health treatment to be successful, clients need to be comfortable with their practitioner. “When somebody goes in for counseling, if they meet with someone who understands them, then they’re much more likely to come back,” Dr. Ayoub explained. When coming back might mean saving someone’s life, it is clear that this issue needs to be prioritized. Local service providers like CALM serve a majority Latinx client-base, and they employ many qualified bilingual and bicultural mental health practitioners to meet this need. In an effort to address this unmet need, Antioch’s MACP Program offers an optional Latino Mental Health concentration that gives students the education and hands-on experience they need to become qualified bilingual and bicultural mental health practitioners. Dr. Ayoub is developing partnerships with local educational institutions (including SBUSD and Santa Barbara City College) with the goal of recruiting more local students who possess the “superpower” of being bicultural and bilingual. At the Santa Barbara Foundation, diversity and inclusion are central to the organization’s mission. The Foundation, through its 18-month strategic planning process, found behavioral health to be an issue of importance in Santa Barbara County. A 2018 study showed that Santa Barbara’s depression rate was 5 percent higher than the state average and 13 percent higher than the federal target figure, which was one of the factors that led to the development of the Foundation’s Behavioral Health Grant Program. The goal of this new Grant Program is to support effective mental health programs that honor diversity by understanding the core needs of all Santa Barbara County residents. To learn more about the Behavioral Health Grant Program (as well as the Foundation’s other Grant Programs), visit our Grant Opportunities page.